Here’s a great tool that you can use to scan for good calendar trades. Calender trades are used if you think the stock price will consolidate and move sideways. Click on the “scan” tab in the TOS (think or swim) platform and use the following scan options. -Market Cap (stock) – Look for highly traded stocks. 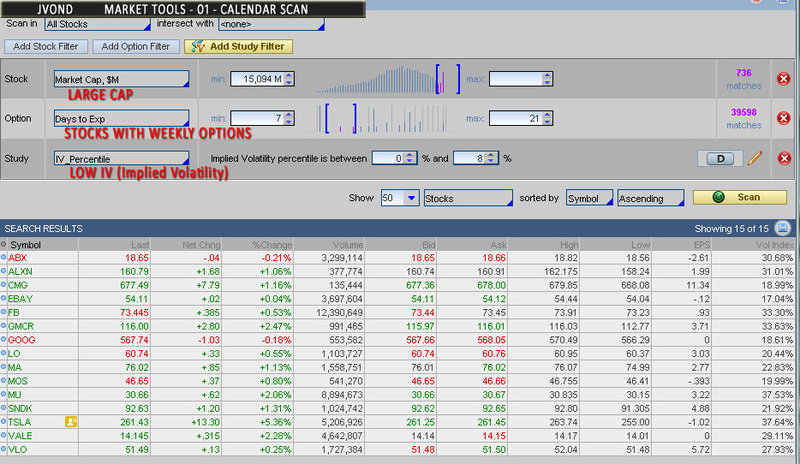 -Days Till Exp (options) – Enter an amount that will look for stocks that have “weekly” options. After scanning I’ll look at technical analysis, industry & market conditions, earnings dates, and chart trends before entering the trade. One of the most important things is the IV%. You want to get in with low IV so that the pricing will be cheap. As the stock moves toward another earnings report the IV will increase and thus making the value of your positions go up. You make money from time value and the directional movement has no benefit. If it moves too much in 1 way then you can lose on this trade but with a choppy sideways market it’s great. Calendars have been working nicely for me recently. Hope this helps find you some great trades!